I was in the wonderful Queen Video yesterday, looking for Robin Hood movies for the kids’ movie night tonight. This required me to flip through their BBC section. I came home with about 400 hours of film and t.v. to watch. Along with Jelly Babies and frost on the windows in the morning, I miss English telly. Imagine my delight when I stumbled on this Channel 4 (not BBC!!) 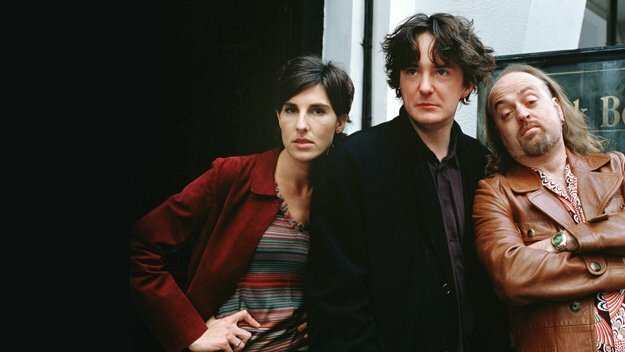 production: Black Books, a sitcom about a misanthropic second-hand bookstore owner, his very patient assistant and the shop owner next door who supplies the wine for their liquid lunches. It’s broad British comedy. Not as broad as Monty Python or Absolutely Fabulous, but headed down that road. I was in tears, howling with laughter until the wee hours of the morning. Nary a word about books themselves, of course, but how lovely that the set is a bookstore and the main character often has his nose in a book. I quite liked that he never actually had to talk about what he was reading. It was just taken for granted that it was absorbing. Great stuff.